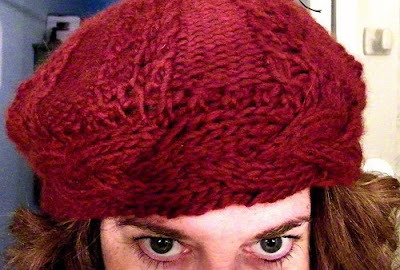 Lucky Knitter: Bonjour, mes amis! I'm settled into my new digs, and have even had a chance to knit a little. I present to you my new hat. "Beer me dos Long Island ice teas, s'il vous plait." Okay, that is hilarious. I think you did a great job. Much better than I would have done. And the beret is completely adorable on you. Glad that you're settling into your new digs. It DOES get better! I don't know. I think you are being a little critical here... I love how your photographer caught the intensity of your gaze in that first photo! Great hat! I'm glad your settled in your new home and are back here...you've been missed! Love that hat! Very cute! 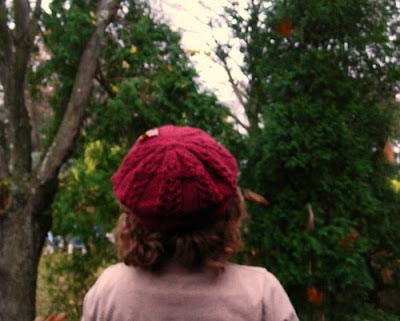 I've been looking for a cute beret pattern. I'm not sure I'm an advanced enough knitter. What skill level is this pattern? Melynda - The pattern is rated intermediate. There is some cabling, but if you have done some knitting and want to try some new skills this might be fun, because the yarn is bulky, so it knits up fast.